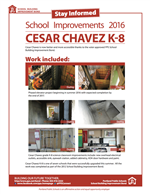 As part of the School Building Improvement Bond, Cesar Chavez received science classroom improvements and accessibility improvements including a phased elevator project that began in the summer of 2016 with expected completion by the end of 2017. View a photos of the end-of-summer Cesar Chavez science classroom and elevator work by clicking here. 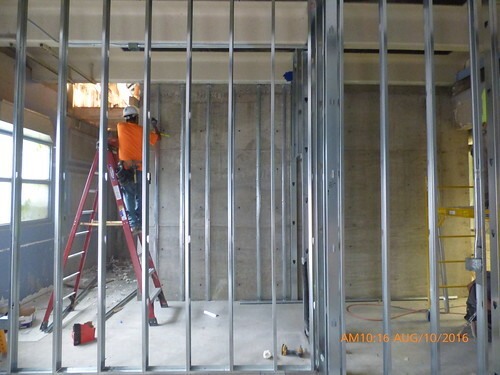 View a photos of the Cesar Chavez mid-summer elevator work in progress by clicking here. Phased elevator project beginning in summer 2016 with expected completion by the end of 2017. Cesar Chavez grade K-8 science classroom improvements include: new overhead electrical outlets, accessible sink, eyewash station, added cabinetry, ADA door hardware and paint. Work began in June of 2016 and ended late August. The work will resume again in the summer of 2017. Updates on the work for next summer will become available ion the spring of 2017. This work is scheduled during the summer to minimize the impact on schools and students. Please view the flyers below to learn more about the work done at Cesar Chavez in the summer of 2016.